Athiya posted a photo on Instagram celebrating her 26th birthday when the Canadian singer commented under it. 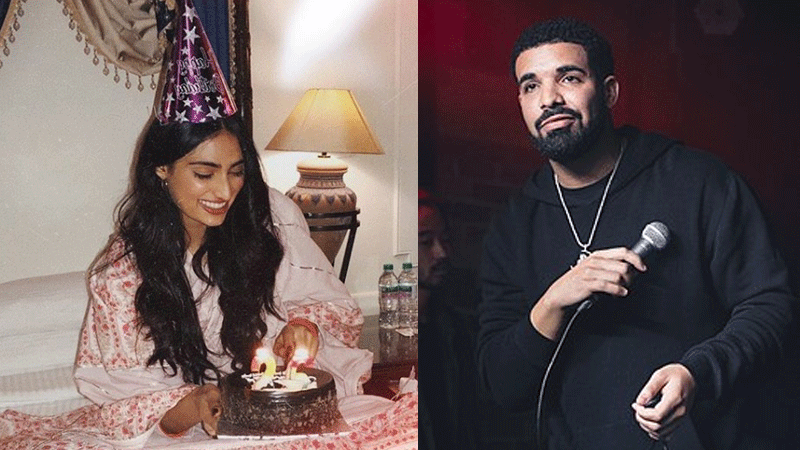 Drake's been pretty vocal about his liking towards Bollywood star Athiya Shetty. Now he reveals he's watching her films too. "Happy birthday to my Shetty, a true goddess! Guess who's watching Mubarakan three times on the tour bus in your honour." Drake has been seen liking and commenting under her photos so this comes as hardly a surprise. 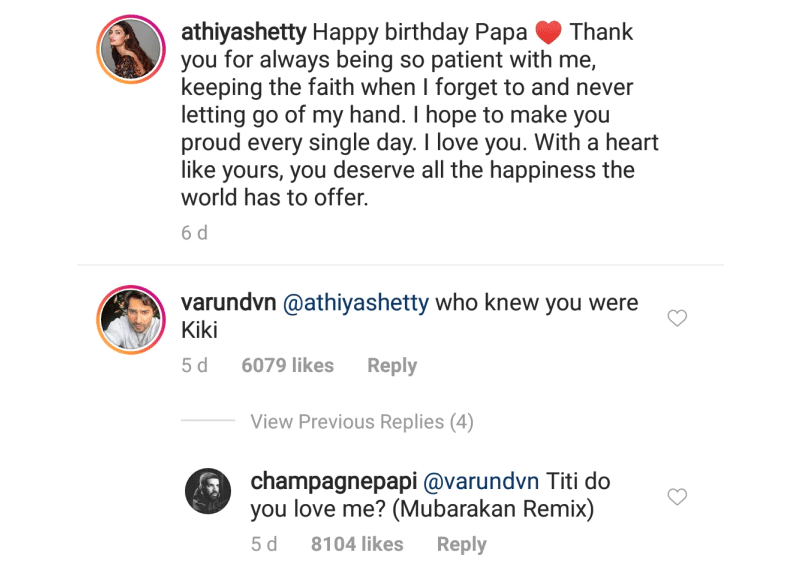 In Aug, the 32-year-old commented on her throwback saying "Legend", which began another conversation with Varun Dhawan and whether Athiya was in fact Kiki. But it seems like the two are just friends. According to one of the actor's close friends, "Drake and Athiya are friends. They met each other about a year ago in at a restaurant in London. Athiya was with her friends and Drake was with his. 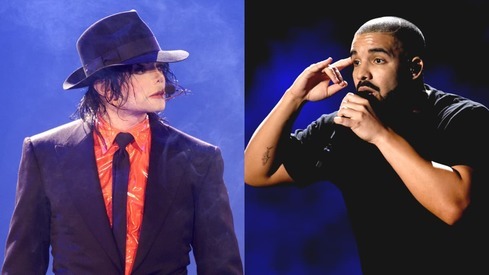 The two hit it off after Drake reached out to Athiya a few days later. 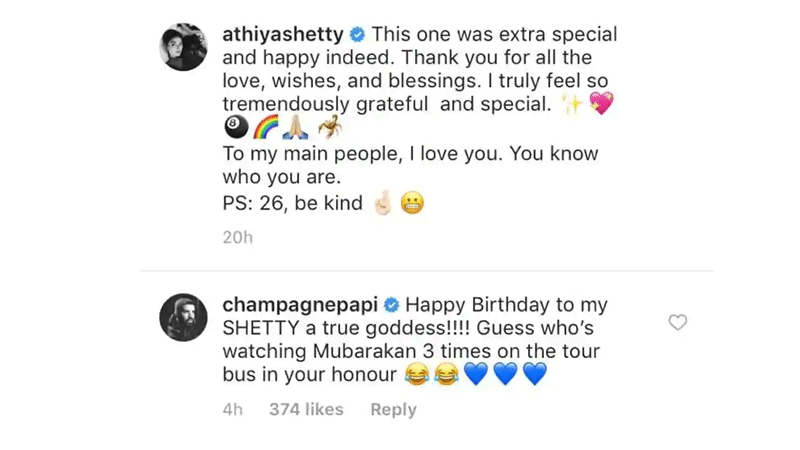 They keep in touch and this is not the first time that Drake has commented on Athiya's posts. Guess Varun's comment made everyone sit up and take notice, but he was just being funny." The friend added that there was "nothing more" to their friendship. "The Kiki bit is all in good humour. It should not be blown out of proportion." Guess Athiya won't be the one receiving the Berkins... (we're secretly hoping she does!). Is Athiya Shetty the new fashion IT girl of Bollywood? Oh my God how can he watch her Mubarakan.Such bad actress with bad acting skills.An example of Nepotism in Indian film Industry.All of her movies are not worth to watch.Inthink Drake is blind in love of this girl Nobody likes her in India. @Samar He loves her in real life, not reel life. Get the difference. mubarakan was pretty bad, too much gloss, low on substance. @Saima No she stares in two movies and both are worthless and her acting skills are so poor.